I was having a particularly bad morning. Dave had picked up my grocery order from Walmart two days prior (if you haven’t tried it, the online grocery ordering is amazing), which had included a container of plain yogurt I needed for the Grilled Gyro Kabobs recipe I had in my head. I had gone to make it the night before, but as I was cooking, I realized I had no recollection of unpacking yogurt. Sure enough, no yogurt anywhere in the fridge. I was instantly pissed off, wrapped everything back up and threw it in the fridge. My first instinct was to lash out at Walmart for obvious incompetence. My second instinct was to ask Dave if he was absolutely positive he got all the groceries out of the car. Of course, he assured me, but I’ll go check anyway. 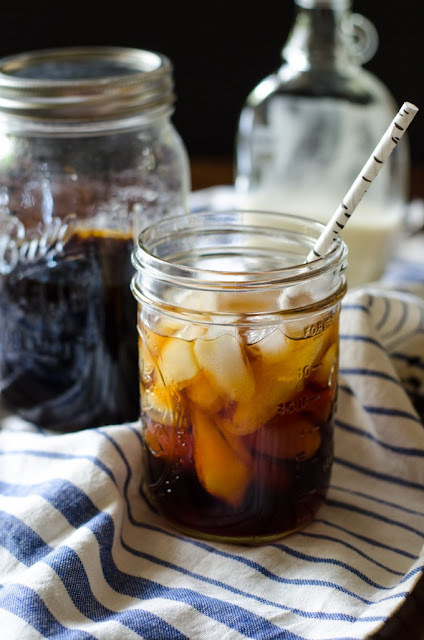 This Cold Brew Coffee with Sweet Vanilla Cream is a favorite of mine from Starbucks! On those awful days when they’re out, now I can make my own! In a large lidded jar (I used a mason jar), combine the coffee grounds and water. Let sit out at room temperature for at least 12 hours or overnight. The next day, strain twice: first through a mesh strainer, and then through a coffee filter (to catch the silt). Coffee concentrate is now ready to use. In a small microwave safe cup or bottle, add the vanilla, sugar, and cream. Microwave for 1 minute and stir to dissolve sugar. Microwave for 30 seconds longer if needed. 0 Response to "COLD BREW COFFEE WITH SWEET VANILLA CREAM "